One of the many challenges with my older ELL newcomers is that they have to learn so many different aspects of language that younger students often have already learned. Many of them already have this knowledge in their primary language…it’s just a matter of touching upon it or introducing it in English. My big struggle is covering these concepts in a way that is engaging for 4th and 5th graders. In the instance of parts of speech (which have come up again in our use of the Vocabulary Graphic Organizer), all it has taken is some sorting and categorizing activities. 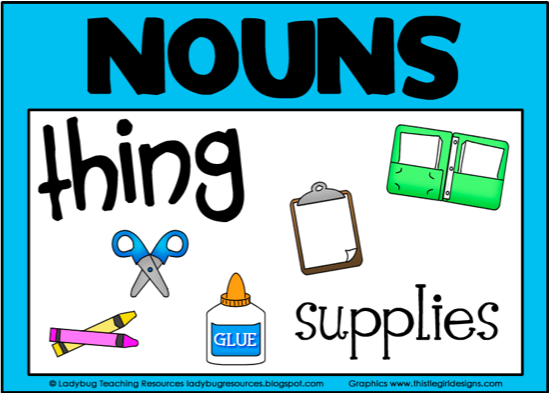 I made these little posters for nouns recently…the kids really like them (I love how they get excited when they find out I made something…isn’t that the best??). Anyways, I kept the signs all labeled as nouns, but separated into person, place, and thing. We did a quick (like less than 5 minute) whole group sorting, then broke into teams. Each team folded a chart paper into 3 columns, labeled them person, place, and thing, and had 7 minutes to fill the categories. With my class (and I’m sure many others) timing something instantly turns it into a fun activity! The more fluent speakers and writers had no problem brainstorming lists of words they knew in English. Many others used our Content Picture Dictionaries. If you haven’t seen these before, you must check them out…this yellow one is for older students (grades 3 to 5) and there is a blue one for younger students. The pages are sorted by topic, with a large picture on one side with all of the related items, then small pictures labeled with the word on the next page. I would even use them in a mainstream class. And they are, of course, ideal for ELL students. Anyhow, I loved some of the words they came up with from the Picture Dictionaries. One of my students had written the word “knight” and when we shared out, everyone thought “night” and no! that wasn’t a person! So it was a neat little teachable moment. The whole activity took about 25 minutes. It was quick and effective for all of my diverse learners 🙂 I’m keeping a larger chart paper with the noun posters as labels, so students can continue to add to their nouns list. I’m working on adjectives next and I’ll be sure to post those when they are ready…have to give those a lot of thought as they would be a really good reference source for our writing if I can organize it well. Thank you for sharing! Very cute! 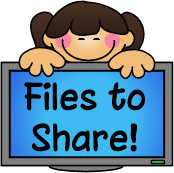 I will absolutely use these – very cute and my 4th and 5th graders are working on the same thing! I'm so glad you guys can use them! I had a feeling you used those too, Ms. M! I almost asked you that in the post! I was wondering. Would it be possible to make a poster for Animals??? 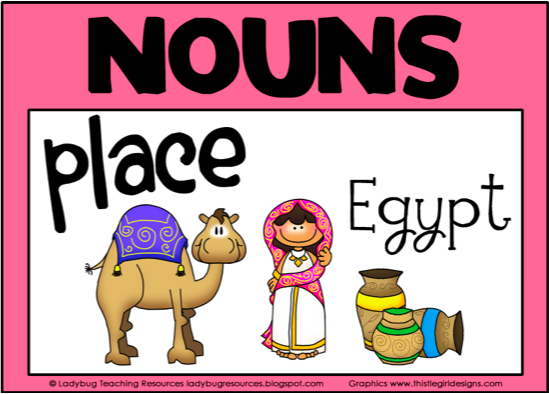 My students learn that a noun is a person, place, thing OR animal. Sure, should be easy…I'll post it later!